Fondazione Calzolari invited Nancy Olnick and Giorgio Spanu on a tour of Arte Povera artist Pier Paolo Calzolari’s private studio on April 3, 2017. They were treated to various of the artist’s works and performance pieces, as well as a visit from the artist himself. From left to right: Karine Marcelle Arneodo, Giorgio Spanu, Pier Paolo Calzolari, Nancy Olnick. Photo by Michele Alberto Sereni courtesy of Archivio Fondazione Calzolari. “There’s nothing that Giorgio and I love more than being able to visit an artist’s studio and get to know the artist. For us, this is what motivates us beyond anything—what really creates our life—is doing this exploration together and being able to further understand the motivations of the artist,” Nancy Olnick said. Pier Paolo Calzolari was one of the first artists the couple were exposed to at the beginning of their exploration of this avant-garde movement. Nancy and Giorgio always admired the juxtaposition between the industrial and natural elements portrayed in many of his pieces. A wide space at Magazzino Italian Art, opening June 28, will be dedicated to the installation of his works. 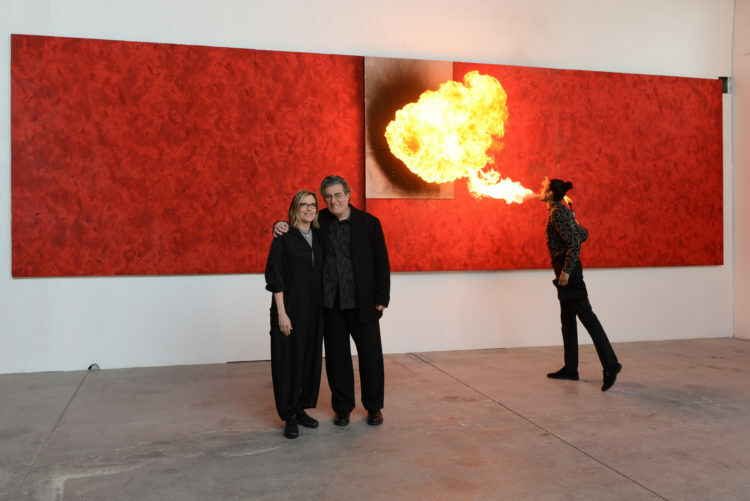 Nancy Olnick and Giorgio Spanu with Calzolari’s performance piece, ‘Mangiafuoco’ (1979). Photo by Michele Alberto Sereni courtesy of Archivio Fondazione Calzolari. The biggest performance piece of the tour was the artist’s ‘Mangiafuoco,’ (1979). 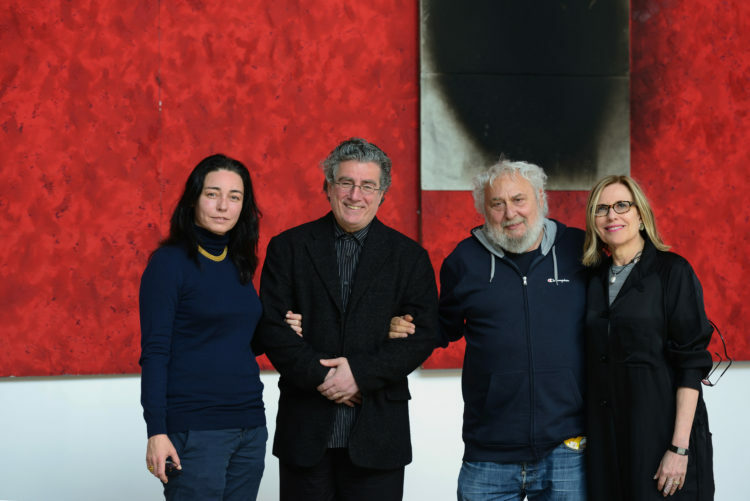 The couple was also pleasantly surprised by the meticulous research behind ‘L’albero di Giuda,’ as well as an overall realization of the depth and magnitude of each work in real life. “To see the work behind us in actual performance was nothing you can get from the picture or anywhere else; seeing it here was truly astonishing,” Giorgio Spanu said.